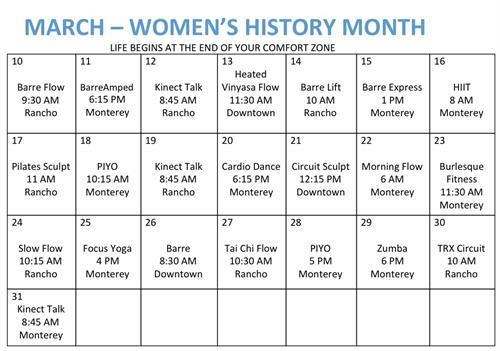 Participate in our March Fitness Challenge! Did you know March is women’s history month? Join us at CarmelBarre to acknowledge all the wonderful, hard-working women! Break out of your comfort zone and attend the new and exciting classes CarmelBarre has to offer. We are featuring one class per day (starting March 10th) and for each featured class you attend, you will receive one entry into our drawing. Five lucky winners will be drawn at the end of the month and prizes range from classic CarmelBarre gear to retail from Stateside, Vimmia, Lilybod, Phat Buddha and MORE!! !